All dive operators on the Gili Islands embark their customers from the beach. Here at Gili Divers we are very fortunate as our boats are able to pull up directly outside our shop 30 meters away from the dive center. So no long walks to the boat! 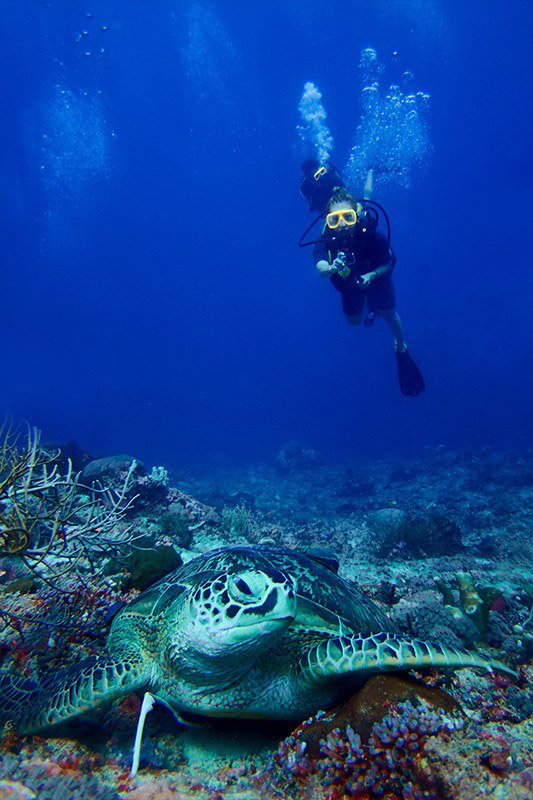 The dive sites around the Gili Trawangan, Gili Meno and Gili Air are relatively close. With our fast boats all the dive sites are within a 15-minute ride away. This allows us to return to our shop between dives so the customer can shower, relax on the beach, in our restaurant or by the pool while deciding which dive site they want to visit next. Consequently all our dive trips are single dive excursions. The exception being specially arranged expeditions. We also have a couple of special night dive destinations a little further away. For people into the bazaar macro life forms we find nocturnal muck diving here, scheduled on demand. Our regular schedule allows qualified divers to choose 3 day dive destinations from a possible 5 available each day of the week. Once you have registered as a diver with us provided you book the evening before for the 9 am dive you are then able to decide as you go along on the remaining dive sites during the day. Also we regularly arrange special trips for groups of divers with the choice of speed boat or regular fast boat. These can be by prior arrangement or casually formed groups from the guests presently diving with us. All dive trips by Gili divers have a dedicated member of staff on the boat as a boat master. This staff member work as a spotter for surfacing divers and cooperate with the local boat crew to pick up the divers effectively. Additionally all divers are accompanied by a qualified divemaster. If you have not dived for 12 months we will normally insist on a check out dive or a Scuba Review. Otherwise we group our divers 4 per divemaster by experience and air consumption.